The bark protects the underlying tissue of the tree and its appearance varies across all the different species. The colour, thickness, pattern and texture of the bark are useful ways of determining a tree’s identity. Not only should you study the appearance of the bark but you should touch it to feel its texture. You can also look at how the bark is peeling as this can also differ, depending on the species. The bark of a young sycamore for example, is usually smooth and can vary from silvery-grey to a brown colour. As the tree gets older, the bark develops cracks which progress to large peeling scales. You need to get up close to the tree and have a good scratch and sniff too! The smell of the bark is also another useful tool, just like with the yellow birch which smells like wintergreen whereas the wild cherry has more of a bitter almond scent. The size, shape, colour, texture and position of the buds can often be a useful way to identify a tree during winter. Flower buds can form in different places and can often be much larger than the leaf buds. The leaves will grow as terminal buds, which are found at the ends of the twigs, or they will take the form of lateral buds, which grow along the sides. The number and placement of the buds on the twigs can also be significant to determining the tree’s identity. The buds are most often enclosed in modified leaves known as scale leaves. These may be tough protective structures, coloured or sometimes they might be sticky, like the horse chestnut. When the scale leaves fall, they often leave distinctive markings on the twigs. For example, the buds of a Hazel tree are short, blunt and have green and red scales and the shoots have rough hairs. Sycamore buds are arranged in opposite pairs and are egg-shaped with a pointed end, green in colour and the tips of the bud scales are brown. Twig markings provide useful information as to how the leaves are arranged when they are there. They can also tell you where the buds grow. Some trees like the ash, maples and dogwoods have opposite branching and this is when the twigs and buds grow off a main branch in pairs. 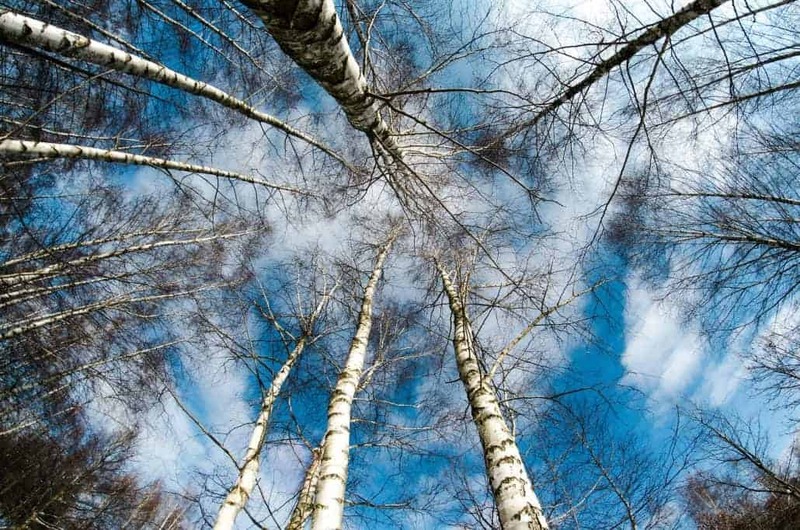 Trees like birches and sycamores have alternate branching which means that the twigs and buds grow off a main branch one at a time. There are many other bushcraft activities you can get up to this winter, it’s a great time to get outside and practice all your bushcraft skills. For expert tuition from a Wildway Bushcraft instructor, join us on one of our popular courses for a fantastic time in the great outdoors.